I have been amazingly fortunate to have had the role of Festival of Quilts Officer for the last couple of years. 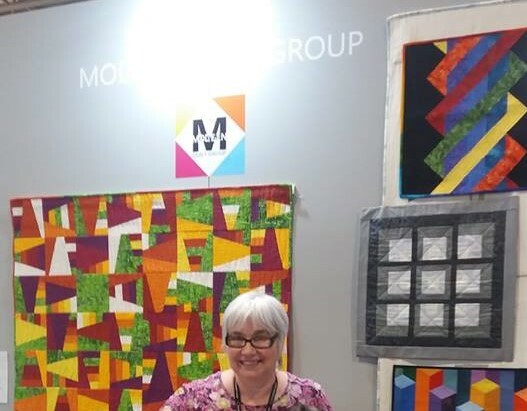 This is a Quilters’ Guild officer role and the job is ….. drum roll please …… to look after Quilters’ Guild people and exhibits at Festival of Quilts. Festival of Quilts is Europe’s leading patchwork and quilting event. It is organised by Upper Street Events, a leading (if not THE Leading) show organiser in creative and sporting “passion-led” markets. The Guild is proud to work with Upper Street, lending our expertise within this passion of ours which is patchwork and quilting, sponsoring competition categories and taking advantage of the opportunity to put The Quilters’ Guild of Britain and Ireland front and centre and ready to help. I add this detail because sometimes people think that the Guild puts on FoQ all by itself – we are but a small (though integral!) part of the event. 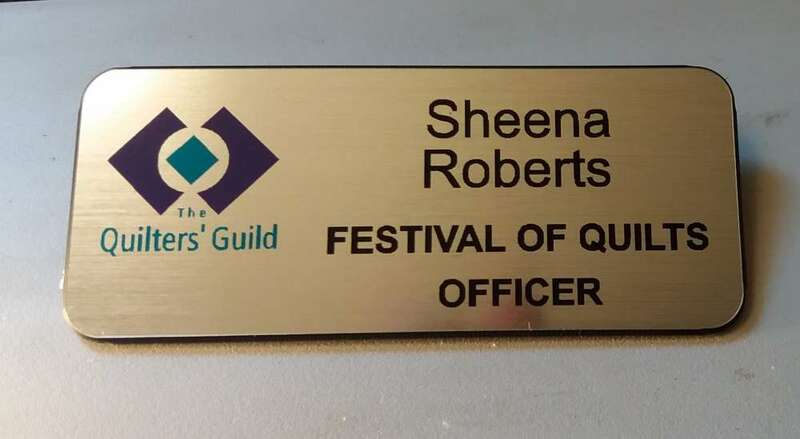 This year, 2019, will be my last year as there is a 3-year tenure attached to Guild officer roles and I will be sad to set it down. Work has already started for me – it’s not just a case of turn up on the Thursday, swan round for a few days and whizz off home on the Sunday! I am one of a group of people, including representatives from the Guild and from Upper Street Events who get together in person or via emails, conference calls etc, to review what went well last year and what can be improved, and try to implement those improvements in order to build on previous successes. I write lots of minutes and chivvy people up quite a lot! My background in admin makes me the perfect person to check the mundane stuff after meetings and (hopefully politely) remind people to do the things they said they would! Soon I will start drawing together the rota and ticket requirements for the volunteers who help to man the various QGBI stands – the main information stand and membership desk, the shop (don’t forget to go and get your Guild diary! ), the Tombola, the Specialist groups, the City & Guild Students’ exhibition and Graduate Showcase and …..I hope I haven’t forgotten anyone! I make sure that volunteers who “work” for 4 hours a day receive a pass for that day and keep my eye on things so that the stalwarts don’t try to spread themselves too thinly. I try to make sure that in the run up to the show itself people know what is needed of them and try to liaise with people to help things run smoothly. I liaise with Upper Street, the Guild, the judging team, the stewards’ team, the Exhibitions Officer (and probably a few more). I arrive at the NEC a good 24 hours before the show opens and help with unloading vans, building/dressing stands, finding lost things and keeping safe found things, whilst keeping out of the way of the judges who are working incredibly hard to judge all the quilts that have been entered. 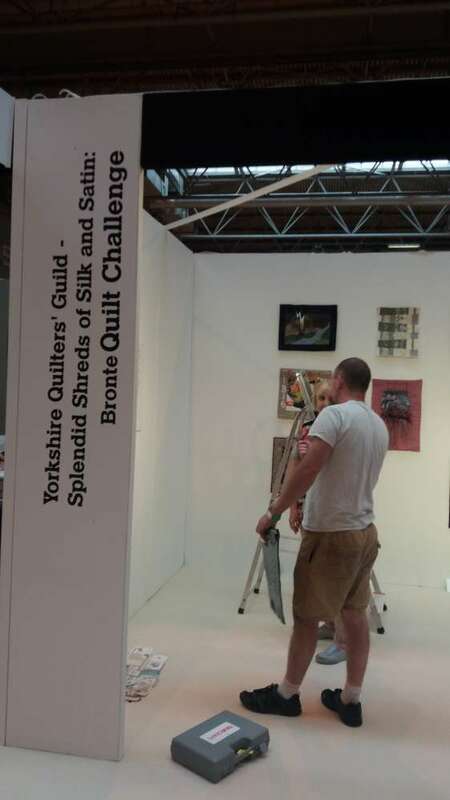 The Hanging team have already been on site getting the competition quilts in place. The NEC is a building site before the show opens so it’s covered-in shoes and fluorescent jacket time (well, it SHOULD be, but not everyone remembers). We work till the job is done – no going home (the hotel room) at 3pm! But I do try to keep an eye on people and make sure they at least have water to drink. I’m no slave driver! The coffee shops in the atrium aren’t always open which can be a bit of a pest. Then it’s Thursday morning, up with the lark (or in my case, 5 minutes before I have to be out – not good at mornings!) to get into the halls before opening time, check everything is ready and that all the volunteers have what they need, and if I managed to be up and out early enough, have a quick look round the show before it opens. Whilst the show is open I split my time between the front Information desk, meeting and greeting members – existing, potential, and never in a million years! I love listening to people, helping where I can, problem-solving and troubleshooting. I take regular trips around the show to check up that all the volunteers are ok, to make sure that they have what they need and that they know they can get in touch with me if there is a problem. Though having said that, there is no guarantee that I will hear my phone! I also check on the stewards – not really “my volunteers” as they have their own person to look after them, but I like to show my face and say hello (and it has nothing to do with the tea and cake!) This year I will have another person with me – next year’s FOQ Officer will be working alongside me to get a handle on the role so that she can take it forward with confidence. Then, when the show ends – do it all in reverse! But this time with only a few hours to get the hall empty, get the vans loaded up and get us all out. Back to covered-in shoes and fluorescent jackets! Such a style statement! After that, I liaise with everyone and get a feedback report from them. I bring the individual reports together into one cohesive document to help us review the event. We have a meeting to tie up any loose ends, address any issues and plan for the next. This is a merry-go-round I will be sad to get off, but I have had a fabulous time these three years and am looking forward to other ways in which I can serve the Guild. 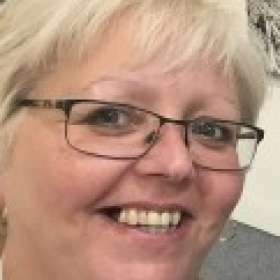 Guild membership is amazing – you really do get out of it what you put in, and I can’t deny that it has been flurries of jolly hard work, but oh, the people I have met, the friends I have made, the laughs I have had. Look after your Guild, your Festival of Quilts, your competitions, and enjoy all the giving and receiving that it affords. 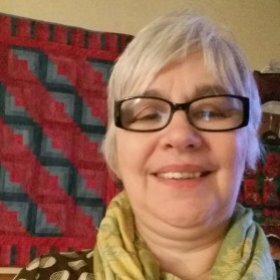 Teaching at Festival of quilts Festival of Quilts cut&alter :: Festival of Quilts – who will be there? Festival of Quilts – The Young Ones! Well Sheena if it’s your last year I shall just have to come along to the show! thanks for all your hard work. The FOQ is my favourite of all the quilt shows. Last year I volunteered to steward and it was great fun. I am looking forward to this year’s event. I’d love be a volunteer one year. Not this year as a friend from Australia has organised her holiday in Europe so we can visit the FOQ together. 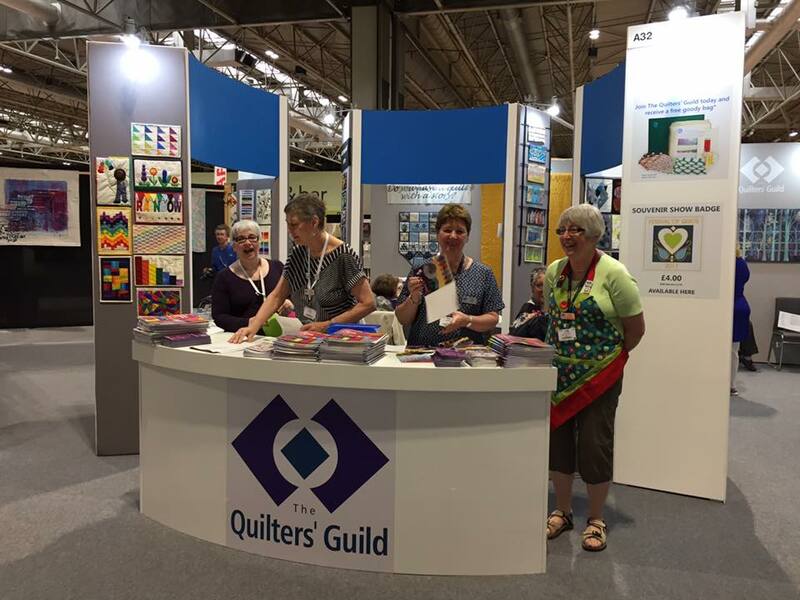 We will enjoy our day together admiring all the wonderful quilts and all your hard work….but maybe next year.